Ricky Holmes has arguably been the standout performer in an exceptional Cobblers team in this exhilarating season. Runner-up in the Sky Bet League Two player of the year and named in the PFA league two team of the year, the former Portsmouth man has caught the eye on a regular basis since returning to the team after a back injury in December. Holmes is proud to have picked up those plaudits, but he insists his impressive form is not just down to him, but to the performances of his title-winning team-mates as well. Asked about the secret to his exceptional form, Holmes said: “You have to look at the boys this season, as it is a lot easier to stand out in a winning team, because everybody is keeping their eye on you. “It’s not just been me this season, there have been 17 or 18 of us that have really stood out and you could pick a whole load out. “There is Smudge (Adam Smith) in goal, Buchs (Dave Buchanan) has played every game, John-Joe (O’Toole) keeps scoring, Zander (Diamond) has been a great leader, so it is not just me, it is the whole team. “But it does just seem to have clicked for me under the management here. “They give me the freedom, and I don’t have to stay out wide which I don’t like doing anyway - you have seen my crossing ability, it’s not the best. “I want to get in the mix, I want to get involved, and wherever the ball is I want to travel over go and got hold of it and really enjoy my football. One of the key aspects of Holmes’ eye-catching form this season has been the amount of goals he has scored, 11 to date in 30 appearances which is way above his career ratio, and also the quality of those goals. Aside from the penalties he has slotted home in the absence of injured regular spot-kick taker Marc Richards, Holmes seems to have been putting together his own goal of the season contest. 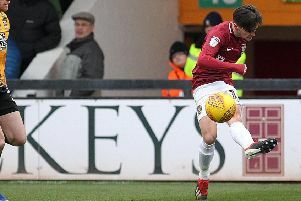 From the 25-yard screamer just seconds after coming on to the pitch in the 4-3 win at Luton Town back in December, to the 20-yard volley in the 2-2 draw with Notts County in April, Holmes has specialised in the spectacular. So much so, that the aformentioned two beauties don’t even figure in the man’s very own top three. Asked to rank his goals this season in a top three, the 28-year-old said: “Third was probably the one at Dagenham, the volley from the corner, which got us the win with me coming off the bench. “The gaffer decided to drop me that game, and I’m not sure that was the right decision! But we had some tough games in that spell, so that would be third. “I’d have to say second would be the one at Stevenage. The occasions made it feel so much bigger, and I think that goal kind of got us over the line, and got us the promotion. “It got us the win we needed from 2-0 down, to win it 3-2 in the last minute. And with two games still to play this season, you wouldn’t bet against Holmes pulling another couple of belters out of the bag.